If red pepper jelly is a condiment you’ve never tried, I suggest you get a jar right away. It’s one of the most versatile and under-utilized condiments out there. It works well in marinades, as a sandwich condiment, and in salad dressings. 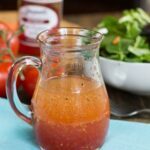 If you’re not currently in the habit of making homemade salad dressings, you will be after making this one. The flavor is the perfect mixture of sweet and spicy and it couldn’t be easier to make. Plus it will keep for days in your refrigerator. The flavor of homemade dressings is so much fresher, without those horrible preservative aftertastes so many bottled dressings have. Just a few simple ingredients is all it takes to make a great tasting dressing. Have you taken a look at all the ingredients in some of those fat-free dressings? Scary Stuff. I’ve adapted this Red Pepper Jelly Vinaigrette recipe from Southern Living, cutting down on the amount of oil. I like a salad dressing that’s a little heavy on vinegar. That way I use a lot less of it because of the strong flavor. And when you factor in that there are fewer calories per tablespoon because you are using less oil, it’s a double win. It may take some getting use to if you are used to oil-heavy dressings, but give it a try. It’s an excellent way to keep your calories low when consuming salad. Because that’s probably the reason you’re eating salad in the first place. Right? 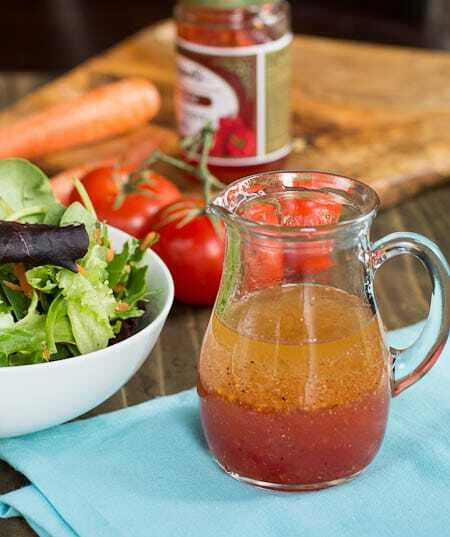 This sweet and spicy vinaigrette made from red pepper will brighten up the flavor of any green salad. This entry was posted in Salads and tagged red pepper jelly, salad dressing, southern recipes, vinaigrette. Bookmark the permalink. Love this dressing thanks for sharing the recipe! I wanted to make this recipe but didn’t have red pepper jelly so I substituted tomato preserves,. It was delicious. Thank you for the inspiration !!! Just wondering if you’ve ever tried this with green pepper jelly or jalapeño jelly. We tried a jalapeño vinegarette recently and loved it. Trying to duplicate it. This is definitely going on the list of things to try! I am a big fan of Red Pepper Jelly! This is a very clever idea to put it in salad dressing form!! 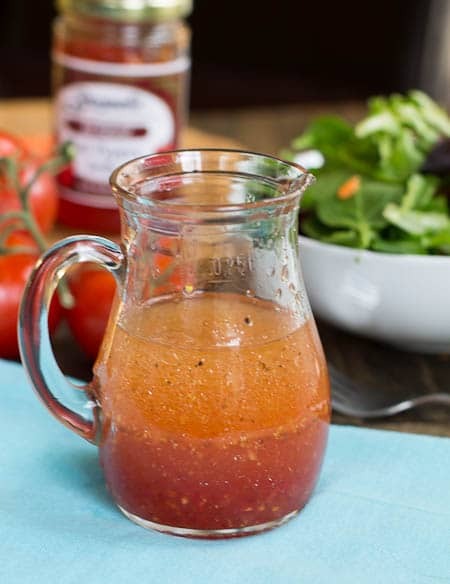 I love homemade dressings and this red pepper jelly one sounds really flavorful and tasty! I’ve never tried red pepper jelly but it sounds wonderful! This sounds delicious! I’ve never had red pepper jelly, but I know I would love it. I think homemade dressings are where it’s at — they’re so much better. Pinning! You would love red pepper jelly. It has such a unique sweet/tangy taste. This is such a unique dressing that will be sure to make any salad a whole lot tastier! Great job! 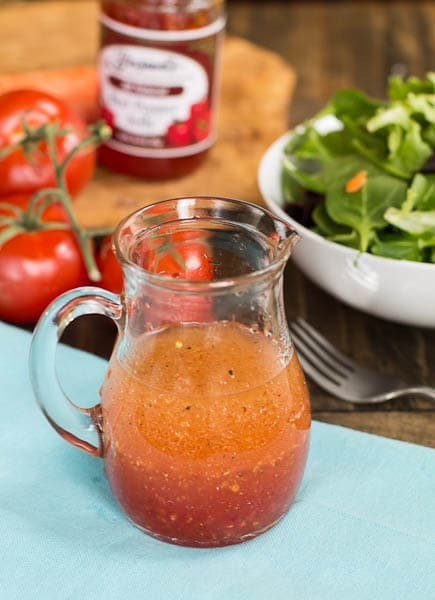 I have never had Red Pepper Jelly Vinaigrette dressing but I am going to try your recipe, looks delicious. I always make my own dressings, like to use balsamic vinegar a lot. We have The Olive Oil Company store in Greenville that I shop at a lot. Not sure if you are familiar with them or not but they have a lot of oil and vinegar vats. Many different flavors from all over the world that you can buy in small or large bottles. Great place to visit and try different oils and vinegars! Love the creative flavor profile! Great vinaigrette recipe! Thanks a lot! Interesting recipe! I love making my own salad dressings. Homemade salad dressings taste so much better don’t they?